About a month ago, some friends found out about a contest called “Hackerspaces in Space”, where the object was to take a picture of the curvature of the Earth, with black sky over a band of blue. This kind of picture can only be taken from space… or from “near space”, above about 65,000 feet. That’s about twice as high as most passenger airliners fly! My friends quickly got together, declared themselves “NCNearSpace“, and researched everything from balloon physics to wind models to FAA regulations. Three weeks later, they launched two helium balloons up to about 80,000 feet. When they retrieved the capsules, they were rewarded with stunning photos. The group was encouraged by their successes, and they sought out help in their next attempt, which would aim for a much higher altitude, hopefully 120,000 feet. This would require a much larger balloon. 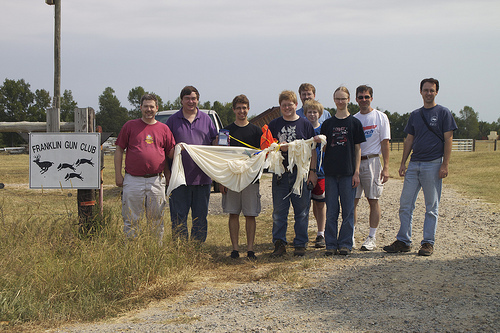 However, the team found that their earlier research had prepared them for this next launch — not much had changed, other than the sizes of the balloon and capsule. One area that really needed some work was the recording and dissemination of position data. The first launch (dubbed “NSL-1”) was supposed to use a small GPS and a ham radio transmitter in a system called APRS. This system worked for a little while, but mysteriously stopped transmitting after 10,000 feet. They never heard from NSL-1’s transmitter again. Feeling rather bummed at the loss of their capsule, they hastily assembled a second launch using left-over parts and a SPOT GPS transceiver, a commercial unit and subscription service which is normally used by sailors, hikers, and mountain climbers. This second launch, NSL-2, did surprisingly well, considering its humble beginnings. The were able to follow the position using the SPOT web site, and they retrieved NSL-2 before the sun set. (About a week later, a farmer found NSL-1 and called the phone number, much to the delight of the team). On the day of the NSL-3 launch, the system worked well. The use of SMS text messages proved to be a good way to get the balloon’s progress to the chase team. When we drove through no-coverage areas, the messages were queued up for us. And when we had 3G data coverage, we were able to see maps of the balloon’s path. For at-home followers, the Twitter feed kept sending out updates, and the Google Map was available. As expected, the balloon went up, reporting its position for about an hour, from 8:55 until 9:40. 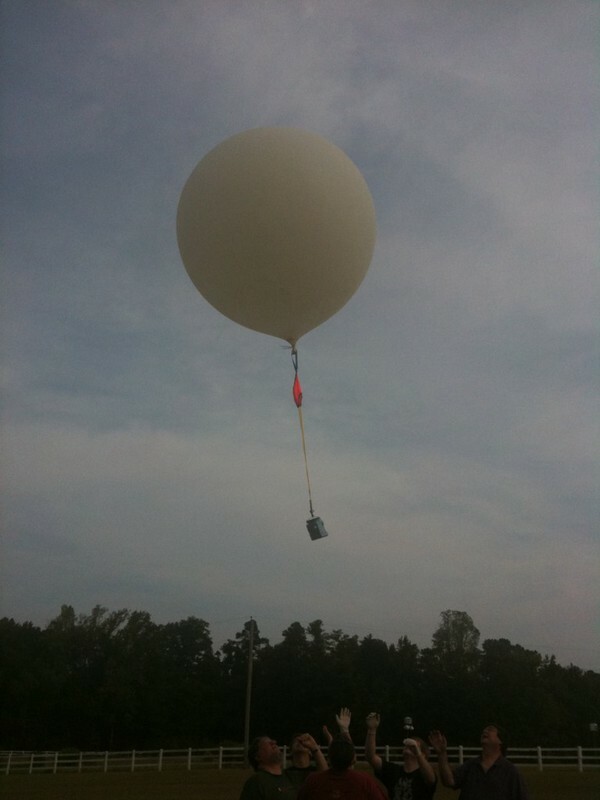 Then, we stopped receiving updates while the balloon was above 60,000 feet (a known limitation of the SPOT). This uncomfortable time lasted about an hour and a half. Finally, at 11:10, we started getting updates again, and they continued for 35 minutes. After 11:45, all of the position updates were in the same place… some light woods next to a farmer’s cow pasture. We were lucky… of all of the places to land, this terrain was not too rough. We got permission from the owner and then crossed the electric fence into the woods, where we found the capsule on the ground, about 40 feet away from a wide path. The balloon did not burst into many pieces as expected, but instead blew out on one side, leaving the flapping remains to get tangled in the parachute. Still, the capsule and its contents appeared to be undamaged. The pictures were, once again, spectacular. But the on-board GPS data was inconclusive — it logged pressure altitude rather than GPS altitude, and even that data was cut off above 30,000 feet. So it’s hard to tell how high the balloon got (remember, NSL-3’s primary goal was to reach 120,000 feet). Our team will be digesting this data for a while… hopefully we can come up with an agreement on its burst altitude. The team is thrilled with another successful launch and retrieval. And we already have plans for future projects. I have a feeling that there may be some data recording, logging and telemetry in my future.